Wichita State continues to apply its famous bracket-busting skills to the NIT. Jaime Echenique scored a game-high 18 points, and the sixth-seeded Shockers held off No. 2 Clemson, 63-55, Sunday afternoon to advance to the quarterfinals. WSU (21-14) will take on No. 1 seed Indiana on Tuesday night (6 p.m. CT, ESPN). WSU (21-14) never trailed but watched the Tigers trim a 13-point lead to three in the final minute. Samajae Haynes-Jones delivered the biggest shot of the game — a step-back three with 30 seconds to play that extended a 58-55 lead to 61-55. Echenique hit 7-of-8 shots, including 2-of-3 from distance, and added three steals. Haynes-Jones recorded his second double-double with 10 points and 10 rebounds. The latter matched his career-high. Markis McDuffie supplied 16 points – three of them on free throws – in 38 minutes to break a pair a long-standing marks. His 153 free throws are the most by a Shocker under modern free throw rules (1972-Pr.). He also broke Randy Smithson’s season mark for total minutes, set during the 1980-81 season. McDuffie has played in 1,125 minutes this year (an average of just over 33 minutes-per-contest). Dexter Dennis scored nine points and grabbed a game-high 11 rebounds whie playing effective defense on Clemson leading scorer Marcquise Reed. Reed scored a team-high 18 points for Clemson (20-14) but needed 20 shots. He was 5-of-20 (0-for-5 from deep) but knocked down 8-of-10 free throws. 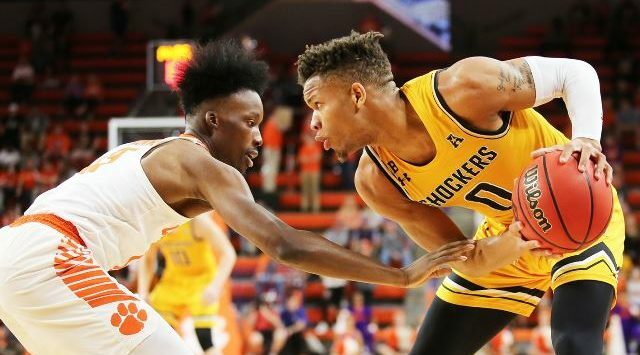 The Shockers committed 17 turnovers but outrebounded the Tigers, 38-34, and held them to just 28.3 percent from the field.